Zinger Bingo Casino will then reward you with a bonus (Welcome Bonus is for new players only). The terms and conditions of the bonuses vary between different casinos and might also change over time and between different countries, so it is important to compare the different offers and read the T&C for Zinger Bingo Casino before signing up. Zinger Bingo is operated by Cassava Enterprises (888 Holdings subsidiary) and under the brand ownership of Tau Marketing Services, featuring a happy-go-lucky theme, with a modern and colourful layout and the gaming offer that focuses mainly on Bingo and Slots. Those who are acquainted with Cassava and 888 Holdings are already familiar of high safety and client protection criteria – Zinger Bingo operates under UK Gambling Commission and Government of Gibraltar legal license, providing fairness tested games, certified by eCogra. A trusting bond formed between a player and an online casino operator is also a result of the safety level that the casino can offer to their members – the gaming offer and the casino’s promotional program, as important as they are, come in second. Zinger Bingo does not gamble with the security of their clients and the operator employ a multi-level protection system that includes encrypted communication and authentication control. Once inside, you can start using your Zinger Bingo benefits as soon as you submit your first deposit; free Bingo tickets are not the only advantage of registering your account with Zinger and the players can count on no-wagering requirement bonuses, cash payouts, and Free Spins. Loyal players can expect all that and much more – VIP members will not only get to spin for free, but they will also be rewarded with free Bingo and cashbacks. Zinger Bingo has their offer divided into two major categories: Bingo and Slots. Bingo players will be particularly pleased with the Game Help section that’s dedicated to Bingo category, including game overview, winning patterns of different bingo variants, instructions on buying bingo cards, info on progressive jackpots etc. Slots category has over 300 mobile compatible games and you can browse through the offer using the search bar at the top. Mega Jackpot games are a part of the Zinger Bingo offer as well and the players can potentially change their lives with NetEnt’s Mega Fortune and Hall of Gods series. Once you launch the casino and access the Zinger Bingo gaming offer, some of the most iconic releases will immediately catch your eye; apart from the above mentioned Mega Fortune edition by NetEnt, the casino also includes Starburst, Cleopatra, Da Vinci Diamonds, Guns N’ Roses, Aloha Cluster Pays, 88 Fortunes… Searching specific games is the casino’s weak point since there are no advanced filters that would allow you to sort the games according to the theme or winning frequency. On the other hand, the casino does focus on Bingo, placing this game at the centre of Zinger Bingo welcome offer, which, considering the casino name, is not really a surprise. 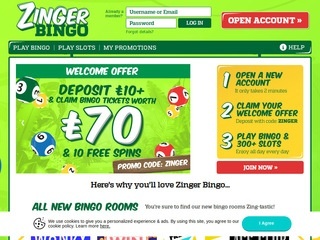 Although Zinger Bingo was launched in 2012, their offer has not been extended to include the entire palette of casino games and this is one online venue that does not provide Roulette or Blackjack tables. The casino games are not, however, entirely banished and a couple of Baccarat variants, Oasis Poker and Deal or No Deal poker can be found using the search option. No such category exists in Zinger Bingo, which is of course justified by the casino’s concept. Bingo is the star of the show and when you scroll all the way down, you will discover Games Help section with a very detailed and elaborate overview of different Bingo variants, winning patterns, advanced gaming options, settings, automatic or manual daubing, basic game rules and other information that may be of interest to a passionate or an inexperienced Bingo player. 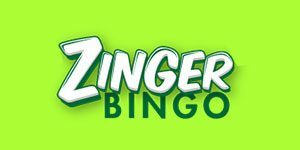 Probably not a shocker, but it should be mentioned that Zinger Bingo does not have any live dealer tables included in their game assortment. Placing a deposit can be done over the phone and the service is available to both UK based casino members and those who reside outside this country. If you prefer more traditional methods, VISA, MasterCard, various types of virtual cards and e-wallets (PayPal, Skrill, Neteller…) are also accepted. The minimum entry is £5 and processing time is instant. Most of the payment options available for depositing can also be used for withdrawals and the pending time is 48 hours. Once the casino approves the payout, the money is settled in 5 business days for credit/debit cards, 3 days for MasterCard and Neteller users, 4 to 7 days for Wire Transfers and 2 to 3 days for PayPal settlements. Live Chat is available from 10 am to 2 am and all the casino members can ask for assistance after login into their accounts. Alternatively, UK residents can call the casino’s phone support, available 7 days a week. The calls are free and the working hours are the same as with the Live Chat support, from 10 am to 2 am.